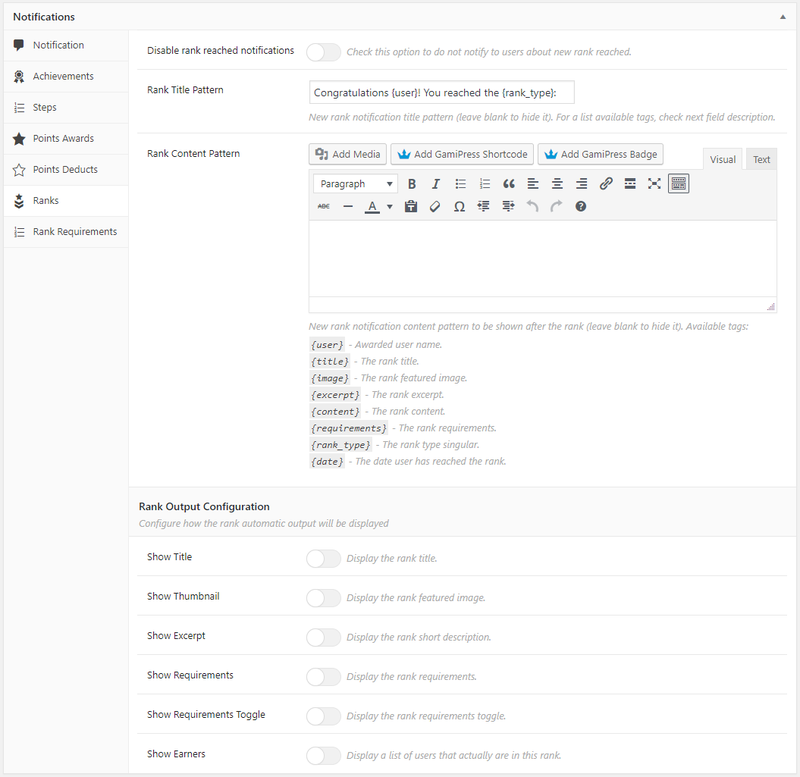 You will find the Notifications settings on your WordPress admin area navigating to the GamiPress menu -> Settings -> Add-ons tab. From this settings you can completely customize the workflow of each notification type. Position from where new notifications will appear. Number of days an user notification is saved before being automatically deleted. Checking this option will completely disable live checks. This will disable the live notification feature but also will greatly reduce server resources consumption. Delay in milliseconds between new notifications checks (1,000 milliseconds = 1 second). By default, 10,000 milliseconds (10 seconds). Important: Lower delay will increase server resources cosumption since new notifications checks will happen early, keep the 10,000 milliseconds (10 seconds) mark as the minimum recommended delay. Checking this option will allow to the user hide the notification clicking on it. Checking this option will automatically hide the notification after the configured delay. Delay in milliseconds to automatically hide a notification (1000 milliseconds = 1 second). Through this setting you can upload, choose or paste the URL of the notification sound to play when a notification gets displayed.. Through this setting you can upload, choose or paste the URL of the notification sound to play when a notification gets hidden (by the user or automatically). Set the notification background color. Set the text color of the notification title. Set the text color of the notification content. Set the text color of the notification links. Checking this option will completely disable notifications about new unlocked achievements. New achievement unlocked notification title pattern (leave blank to hide it). 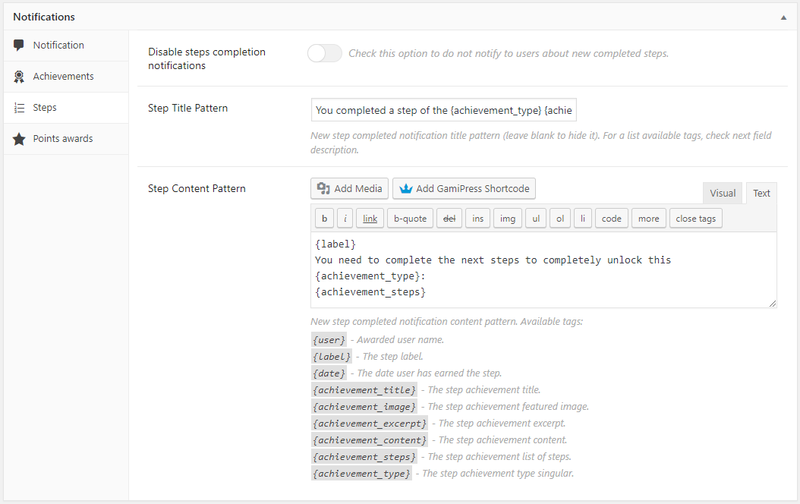 New achievement unlocked notification content pattern to be shown after the achievement (leave blank to hide it). From this group of options you can configure how the achievement displayed in the notification will look. Also, on this options will appear options added by other add-ons like “Show discounts” option added by the Easy Digital Downloads Discounts add-on or “Show progress” option added by the Progress add-on. Checking this option will completely disable notifications about new completed steps. New step completed notification title pattern (leave blank to hide it). 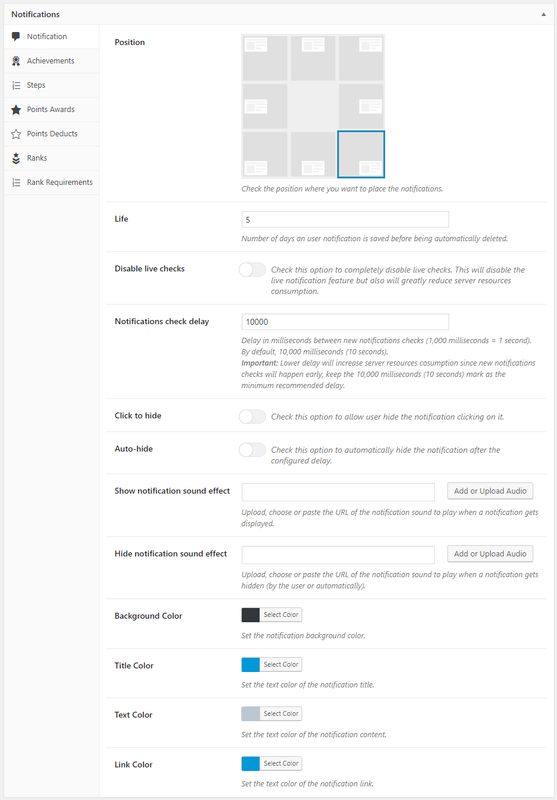 New step completed notification content pattern. Checking this option will completely disable notifications about new completed points awards. New points award completed notification title pattern (leave blank to hide it). 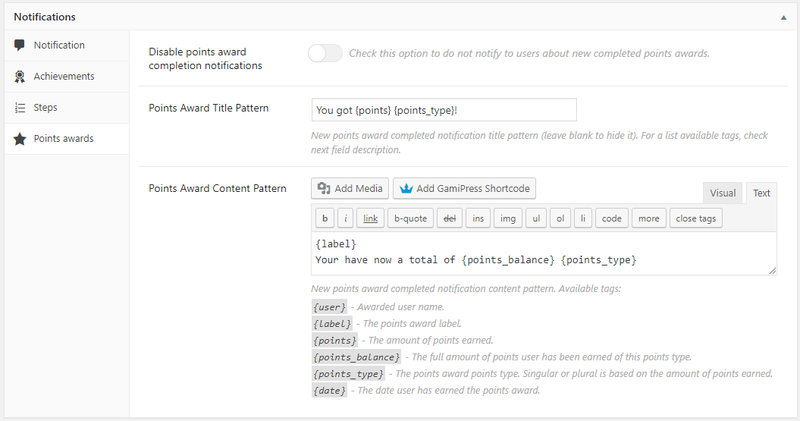 New points award completed notification content pattern. Checking this option will completely disable notifications about new points deduction. New points deduction notification title pattern (leave blank to hide it). 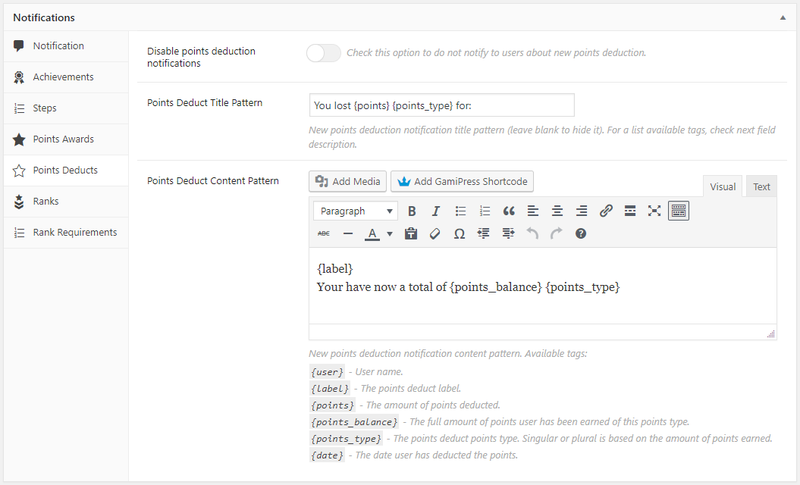 New points deduction notification content pattern. Checking this option will completely disable notifications about new rank reached. New rank reached notification title pattern (leave blank to hide it). New rank reached notification content pattern to be shown after the rank (leave blank to hide it). From this group of options you can configure how the rank displayed in the notification will look. 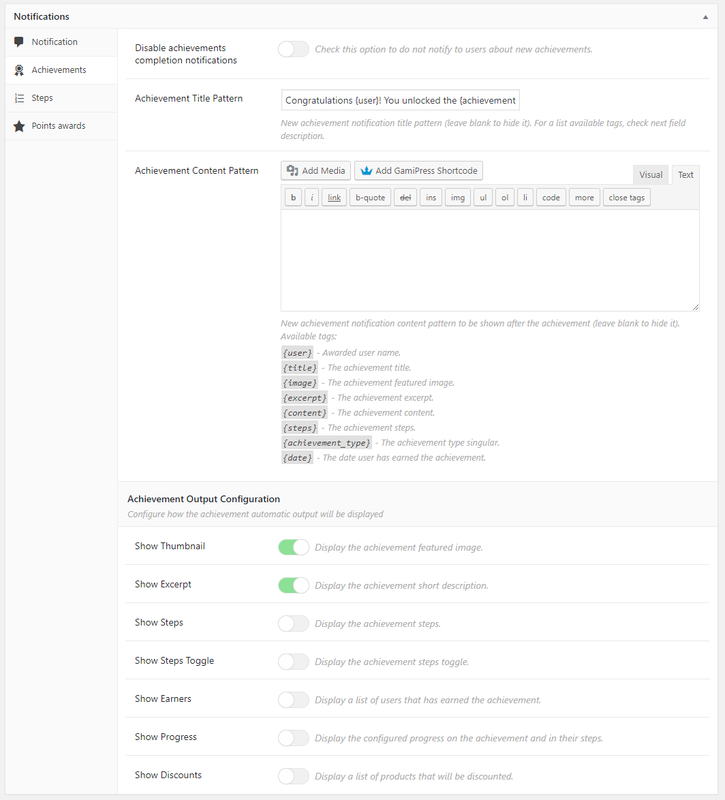 Also, on this options will appear options added by other add-ons like “Show discounts” option added by the WooCommerce Discounts add-on or “Show progress” option added by the Progress add-on. Checking this option will completely disable notifications about new completed rank requirements. New rank requirement completed notification title pattern (leave blank to hide it). 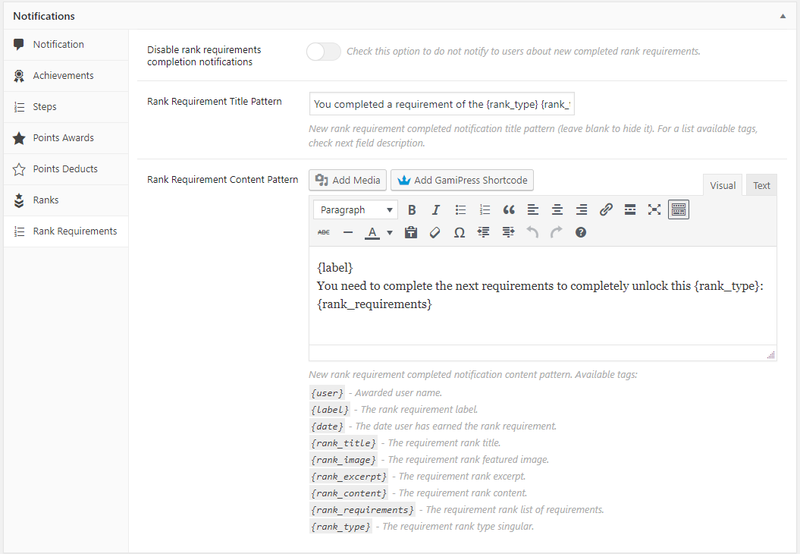 New rank requirement completed notification content pattern.